The warnings were in effect until 1p.m. Saturday. 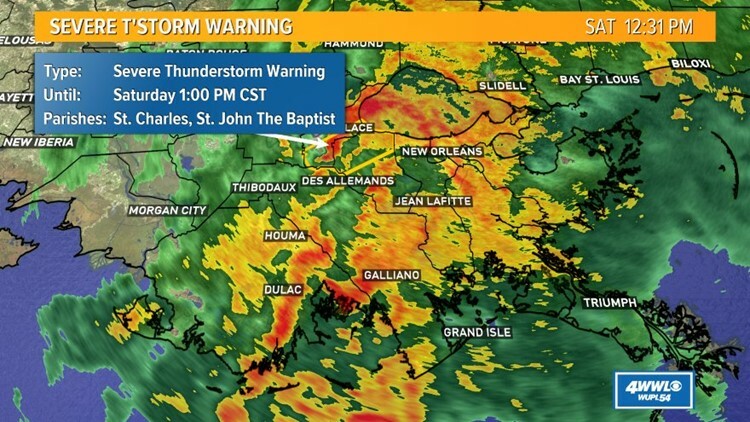 Severe thunderstorm warnings were issued for St. Charles and St. John the Baptist parishes until 1 p.m. Saturday as heavy rain moves across the area. Winds of 60 miles per hour were possible, however there are no reports of damage related to the storms at this time. The majority of the area is still under a Flash Flood Watch Saturday until 6 p.m. The WWL-TV weather team forecasts 2 to 4 inches of rain is expected with some possible street flooding. Most of the heavy rain will be moving out of the area by mid-afternoon a with some lingering lighter rain possible into the night.